Let’s talk BEER! As Ben Franklin once said “Beer is proof that God loves us and wants us to be happy.” We agree! And if you want to market your company or organization, you might want to consider this growing demographic. As you may already know, the Craft Beer industry is exploding in the United States, and more and more people fall into the category of “beer drinker.” So reaching this valuable demographic might be a smart business move for you! So let’s take a look at some great promotional items that are sure to reach the beer drinkers heart. Stainless Growler: If you are not familiar with the Growler, it is a 64 oz container to transport beer in. Craft Beer drinkers will buy them and take them to each Tap room they visit so they can take home some of the sweet nectar. This new stainless growler is single walled and beautiful. Check out this cool product here. Standard Glass Growler: Don’t like the stainless look? No worries. We have the traditional growler as well. You can see that here. Contact us for a quote on these! Bottle Shaped Opener: This is a great looking new product for the Craft Beer enthusiast…and possibly the Craft Beer establishment. Maybe the bottle opener idea does not sound new, but the shape and look of this product mimics the look of the bottle. And with a full color imprint, you can make the opener really mirror the brand. Cool stuff…check it out here. 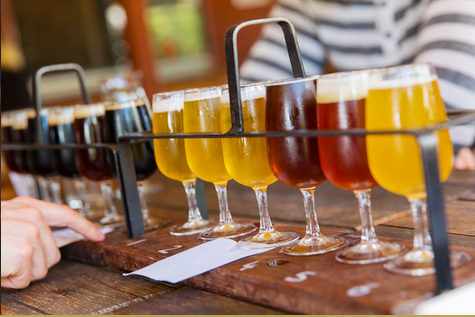 Flight Kit: When we head to any craft beer establishment, we want to know if we can order “a flight” of beers. The idea is you get to try small samples of several different styles so you get a sense of what the establishment has to offer. The best beer drinkers (and home brewers) would love to do that at home! Check out this cool flight kit. What a great gift for any beer drinker on your list! Craft Beer Calendar: Do you want to check out new beer all of the time? If you do, then this Craft Beer Calendar might be a great promotional piece. This is the perfect piece to put your logo on in order to “co-brand’ with craft beer. And as is the case with any calendar, you get exposure all year long! Check out this great price point too. If you want more ideas about ideas for beer drinkers, you can shop on line here. Or you can reach out to us and we can help create a campaign that is perfect for you. Just email here.